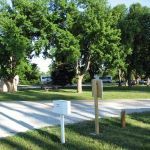 Ask fellow campers about "Offutt AFB FamCamp (Military FamCamp)" and nearby attractions. Nice park for the money. Apparently there was lots of rain recently and everything was super soggy or flat out wet!! Most sites are back in onto a concrete pad. We heard trains during the day but not at night. What was awful was the garbage truck at 0600 followed by the lawn mower at 0630!!! We camped at Offutt AFB FamCamp (Military FamCamp) in a Travel Trailer. Nice lake to jog or walk around. Beautiful campground located on a 113 acre lake. Campstore has snacks, drinks, fishing supplies, bike rentals and lake equipment. Our pull thru was long, concrete and level with a patio and picnic table. Used antenna to pick up 25-30 channels. Large play area, disc golf and volleyball. Across from base. Clean and well maintained. We camped at Offutt AFB FamCamp (Military FamCamp) in a Fifth Wheel. We were so excited about the lake for our Labrador but no swimming for people or dogs. It is so beautiful and the debris should be moved out so swimming areas can be established Good Hosts and lots of beautiful grassy areas to walk. the site was long gravel and dirt but everything was clean. Would have stayed longer but camp was booked' We camped at Offutt AFB FamCamp (Military FamCamp) in a Motorhome. Very nice to stay. Good neighbors, safe, wonderful lake, great recreation facilities and rentals. Check in got us a long pull-thru so we would not have to unhook our trailer. Camp host and hostess come around to see if we're okay and if we need anything. We stayed an extra day because it was so nice. Even rented some archery equipment and shot arrows (a first!). A couple of suggestions: One, fill in the potholes. Two, add more sites. Three, take out the hazards in the lake (concrete/rebar) and make a quartered off area for swimming with bouys marking the limits. The lake is too gorgeous to resist swimming. We camped at Offutt AFB FamCamp (Military FamCamp) in a Motorhome. Go to the Lauritzen Gardens in Omaha and take the train ride as well. Had originally to stay 2 nights but there was sever weather in our path so we decided to spend an additional night. The campground hosts were very friendly, the park was very nice with lots of grass in between each site. Lots of shade trees, a concrete slap and a picnic table on the patio. The roads were full of potholes so be careful. We were in site 22 and had good satellite access. We camped at Offutt AFB FamCamp (Military FamCamp) in a Motorhome. We had a great site backed up to lake. Nice clean park, close to Omaha attractions. Nice walking trail all the way around lake. Some train and aircraft noise but not annoying. Sound of freedom! Small snack bar and equipment rental on site. Patio for site oddly situated. We camped at Offutt AFB FamCamp (Military FamCamp) in a Fifth Wheel. Planes, trains and tractor! All before 0700! Trains were the worst, especially at night and early morning. Use exit 364 and follow directions from their website. Easy to find! No pull through sites, all back in but some are longer than others. Fairly level concrete pads with a picnic table. Lots of room between sites. We spent one night here and had to unhook because it was just long enough for our 30 ft RV, not the truck. They enforce the no parking on the grass rule here! No WiFi at all. Nice walk around the lake. They are closed on Wednesday so we didn't go into the boat house but that's where you check in and where the bathrooms are. Overall a good place for the price, would stay here again. We camped at Offutt AFB FamCamp (Military FamCamp) in a Travel Trailer. Beware of massive construction going on if you want to go to the base and don't believe the GPS, that gate is closed. Use US34 &U 75TH. Beautiful park. Staff great. No cable. 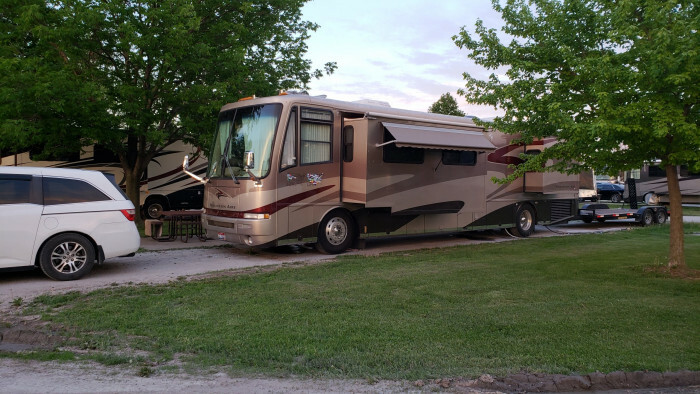 We camped at Offutt AFB FamCamp (Military FamCamp) in a Motorhome. We stopped here for one night while passing through. Do some geographical research before you come here. The FamCamp is not on the base. It is located just east of the runway outside the fence at what they call the "base lakes" area. Getting to it requires a lot of street running through Belleview. The MWR office is beside the campground. Staff was friendly. There is a snack bar and pool here. The campground pads are densely packed. Since this is off base non-military people can use it as a guest of a sponsor. We met some of them. We camped at Offutt AFB FamCamp (Military FamCamp) in a Travel Trailer. Spent one night on our way across country and was surprised when we pulled in and discovered all the water spigots open. They decided to turn the water off and didn't tell us when we made reservations a month earlier. Luckily we had a full fresh water tank. One of our neighbors told us about the bathrooms in the boathouse building and gave us the combination to get in. We never saw a camp host, but there was someone at the boathouse, when we went in the next morning, who directed us to the tank-fill spigot in between spaces 3 & 4 next to the horse shoe pits. Sites had nice concrete pads with gravel approach and departures and had plenty of room around them for slides, awnings, and such. WiFi was good, with no password required and had 2 or 3 bars depending on which antenna you used. Showers were inserts into older stalls, so they were very small for my 6' plus frame. Bathrooms were dated, but very clean with plenty of hot water and good pressure. We stayed here to visit the SAC Air & Space Museum, (which is about an hour away past Gretna), so we didn't use any other amenities. Aircraft and trains were heard but never disturbed us - your sensitivity may vary. We'll stay here again, but hopefully the water will still be on! 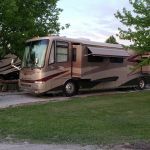 We camped at Offutt AFB FamCamp (Military FamCamp) in a Motorhome. I cannot really add much more to the previous reviewer (Next Mission). This is a terrific campground, with paved and level sites, a beautiful fishing lake, and great customer service. WiFi was good for us, and we noticed at least four hotspots. We will definitely camp here again. We camped at Offutt AFB FamCamp (Military FamCamp) in a Fifth Wheel. Lots to see and do in Omaha. Don't miss the pedestrian bridge over the Missouri. Very restful place to stay. It looks like they have made improvements to the children's play areas. The bathhouses look pretty rundown though. The lake looked great this year. We stay there at least once a year. We camped at Offutt AFB FamCamp (Military FamCamp) in a Motorhome. On a lake with paddle boats, canoes and kayaks available for hire for under $10. Also archery range and disc golf with free loaner equipment. Each site has level double wide pad, electric, water and sewer. We have stayed at many nice FamCamps, but this is my favorite so far. It is off base, but still heard rivalry...which is part of the charm. We camped at Offutt AFB FamCamp (Military FamCamp) in a Motorhome. If you're military and in the Omaha area, this is the campground you need to stay at; DOD card holders can also sponsor guests. 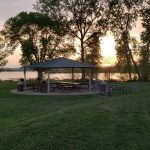 The campground is one of the best we have stayed at and it is only 20 minutes from downtown Omaha. 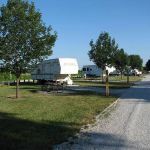 The FamCamp is not located on-base (just east of base), easy to access, and can accommodate the largest motorhomes/fifth-wheels or smallest travel trailers. The 40-full service hook-up sites with concrete pads are well laid out, well maintained, and very quiet except for an occasional jet which you'll barely notice. The host is very active with mowing occurring on Wednesdays. Most sites are flat and may require a single yellow block for trailers without auto levelers. Most of the sites are back-in although there are a large number of pull-thru. The 113 acre lake has fishing for everything from smallmouth bass to walleye to catfish (NE state license and base lake permit required & catch-and-release encouraged). 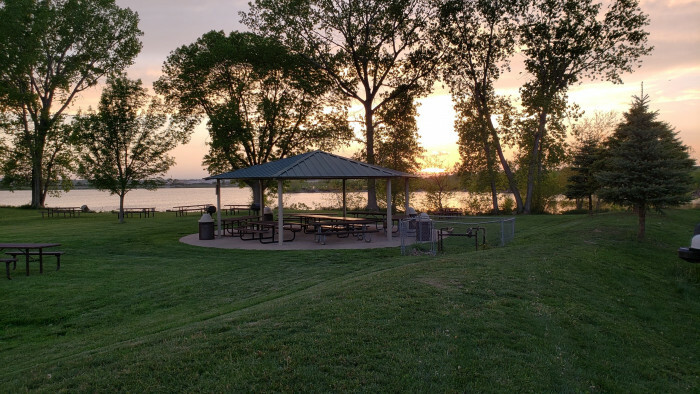 The park and picnic areas have disc golf course, sand volleyball courts, basketball court, horseshoe pits, archery range, two very nice playgrounds, and at the boathouse there are paddle boats and canoes. Fitness enthusiast will love running around the lake on the half-paved primary/half-gravel secondary road. The boathouse also has two private rooms that include a shower, sink, and toilet (access code required) and a laundry (access code required) all which are well maintained and very nice. There are no fire pits. WIFI was spotty and we ended up using our Verizon MIFI for internet access. Five-minute easy access to town. We would absolutely stay here again in our Travel Trailer - Hybrid. We camped at Offutt AFB FamCamp (Military FamCamp) in a Travel Trailer. The website actually provides waypoints (41.115024600, -95.882063900), not coordinates (N 4106.901 W 9552.924). Our updated 2015 Garmin GPS (iPhone web map) did not have the route from the south correct and any size motorhome/RV should follow the Offutt AFB sign on the interstate; the new four-lane road will connect with the road loaded in the GPS - no underpasses. Lovely campground on beautiful little lake. Easy to access from interstate and convenient to Omaha and Council Bluffs. No view of lake from our site but it was close and had nice places to walk. Nice view out the back of open fields. Quiet and peaceful. Will definitely stay again if in the area. We camped at Offutt AFB FamCamp (Military FamCamp) in a Fifth Wheel. Are you affiliated with Offutt AFB FamCamp (Military FamCamp) ?